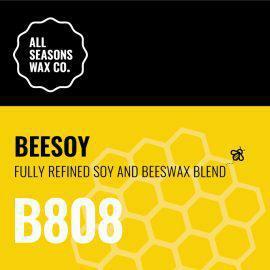 The newest addition to All Season Wax Co.'s range of candle waxes is the epitome of premium quality wax, the exciting and unique BeeSoy B808. Created with the same superior quality soy beans that are used to produce ASW's other four waxes and delicately blended with ethically sourced beeswax, our BeeSoy B808 will become a household name for years to come. Achieve super creamy candles which have a host of additional benefits with the inclusion of beeswax such as, aiding with air purity thanks to the negative ions released when burning beeswax. When burning the BeeSoy B808 you’ll notice a soothing and calm flame, another characteristic unique to burning beeswax. The BeeSoy B808 contains no paraffins or polymers and is a 100% natural wax. BeeSoy B808 is the world’s first flaked beeswax and soy wax blend. Designed for candle makers looking for a point of difference to take their candles to the next level. Using the same unique hydrogenation method that’s proven successful with our other four waxes, you can expect the same consistency and quality All Seasons Wax Co is famous for. Suggested Max Fragrance Load: 8-10% – this depends on the potency of the fragrance so testing is required. Contents: Ethically sourced beeswax delicately blended with premium quality hydrogenated soybean oil. **Heating above 85°C for too long may cause the wax to discolour.